In Part 1 of my series on tax pools, I explained how the new dividend-paying junior producers will use up their tax shelters by drilling less—crimping cash flow much sooner than expected. Below, I use the companies in the BMO Nesbitt Burns coverage universe that have reported their current tax pools (not everyone does), and then measure this against corporate cash flows (annualized for the 2012 calendar year). On the horizontal axis is total tax pools for all E&Ps that have reported. On the vertical axis is their cash flows—annualized for those companies that have not yet reported their Q4 financials. There are different kinds of tax pools. Some more valuable than others, because a greater portion can be written off against income immediately, rather than drawing out the deductions over several years. For this analysis, I look at total tax pools—because many companies only report their total, without breaking it down into different types. This metric still gives a useful picture of who has enough credits to shelter income for the coming years, and who is going to get hit with a stiff tax bill soon. A few things jump out from the analysis. The oldest and largest companies have generated the largest tax pools (plotting further right on the chart)—because they’ve drilled a lot of wells over their lifetimes. Enerplus (TSX:ERF) and ARC Resources (TSX:ARX) top the list for total tax pools, holding just under $3.5 billion and $2.5 billion in pools, respectively. Peyto (TSX:PEY) also holds significant pools, at around $1.3 billion. Smaller firms range between about $50 million and $850 million in pools. Whitecap Resources (TSX:WCP) is at the top end of this range. Twoco Petroleums (TSXV:TWO) is at the lower end. This is a big spread for tax pools across the space. Interestingly, these companies all have a much tighter range of cash flows, from about $25 million (Southern Pacific—TSX:STP) to $130 million (Twin Butte—TSX:TBE). That means some of these smaller companies have very large tax pools relative to cash flow—enough to shelter income for several years. Whitecap is a good example. But we see that others are running on tax-pool fumes, such as Raging River (TSXV:RRX). One anomaly on the chart is Athabasca Oil (TSX:ATH). The company has large tax pools of just under $1.7 billion. That’s because of large amounts of cash spent on setting up its capital-intensive oil sands operations. But the long development horizon on these projects means Athabasca isn’t yet making any money—making the company a tax pool bank that just keeps accumulating credits. That’s a company’s total tax pools divided by yearly cash flow. In other words—how many years tax credits can shield income at current production rates and netbacks. Those with low cover ratios can only shield their cash flows for a short time before taxes kick in. For Raging River the ratio is only 1.8. ARC Resources is also at the low end, at 2.5. Despite that company’s large tax pools, it cash flows nearly a billion dollars annualized. This metric is revealing. Consider ARC and Enerplus—two companies widely regarded as comparable “elder statesmen” of the Canadian oil patch. Both produce considerable cash flows and dividends for investors. But Enerplus enjoys double the cover ratio of ARC, at 5.1. The analysis also shows that companies like Bonterra (TSX:BNE), BlackPearl (TSX:PXX) and Angle Energy (TSX:NGL) enjoy very comfortable cover ratios. Investors buying these firms should be free from a sudden visit by the taxman. Unfortunately, tax pool information is not required in standard TSX company financial statements or MD&As. Investors may find numbers from select companies in such documents (search “tax pools” in your PDF search function for a quick look), or in Annual Information Forms (available on SEDAR). For companies that don’t report numbers in any of these, a phone call is necessary. Ask management about their total tax pool holdings. Better still if they can break that amount down into Canadian Exploration Expenses (which can be used 100% in a given year) and Canadian Development Expenses (where only 30% can be used each year). In the new “growth and dividend” E&P world, these things are critical to note for investors. Stock-buyers may find companies with unrecognized tax-pool value. 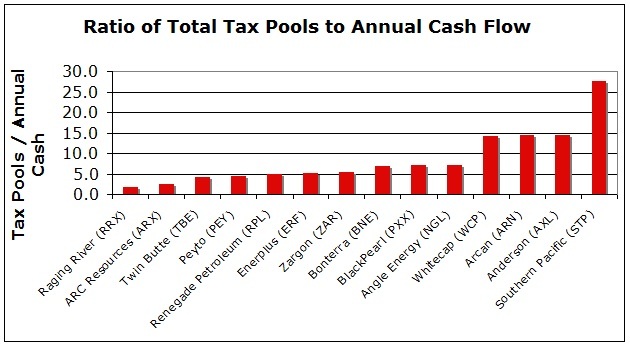 Look for those firms that have high cover ratios—big tax pools relative to their cash flows. Equally, beware (or at least be aware) of companies with small and shrinking tax pools. These companies will “gear down” in cash flow when they start paying taxes. Lower spending = lower production = lower valuation. If the answer is no—and the tax pools are tight—stay away. Publisher Note: In Dave’s next–and final–story (part 3), he’ll show you how this little-known but all important tax pool metric could start driving M&A activity in the oilpatch–and who the most likely targets are.